halloween | A bit of this. A bit of that. This is my maiden voyage taking part in a Creative Challenge with the My Favorite Things design team. Every month, the crew puts up some kind of challenge with team. So I’ve got a couple projects to share with you today. Brace yourselves. Not a single one of these projects involves a card. Yes, like I said, brace yourselves. Each of these things are little things to give out on Halloween so let’s do it. 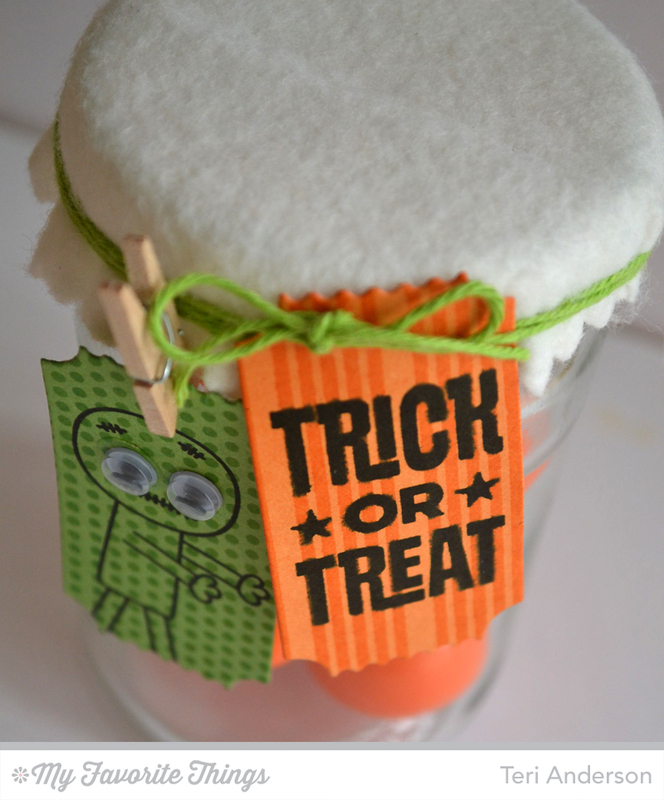 Up first is this little jar package of treats. 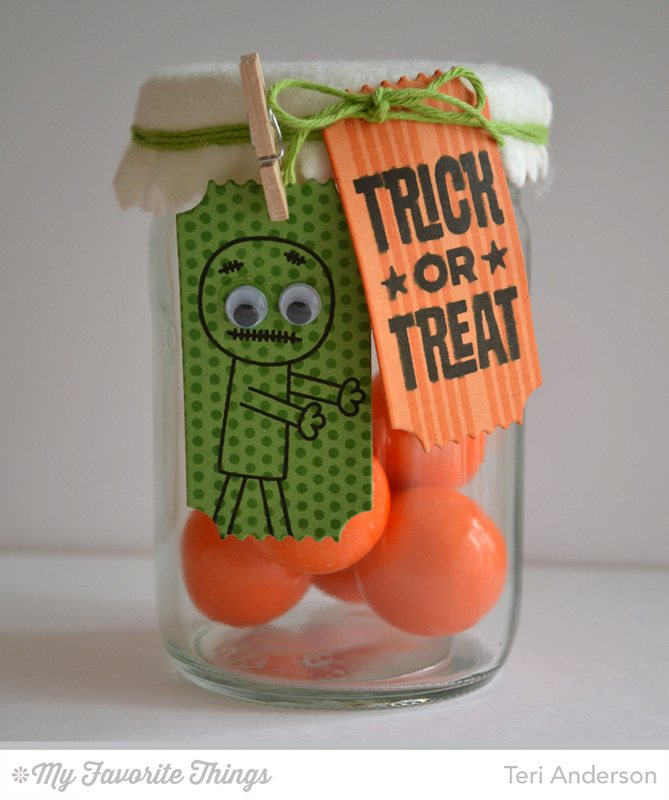 I filled up a little plastic tube with gumballs and then made a little tag to put on it. The base of the tag is MFT’s Just a Ticket Die-namics die. 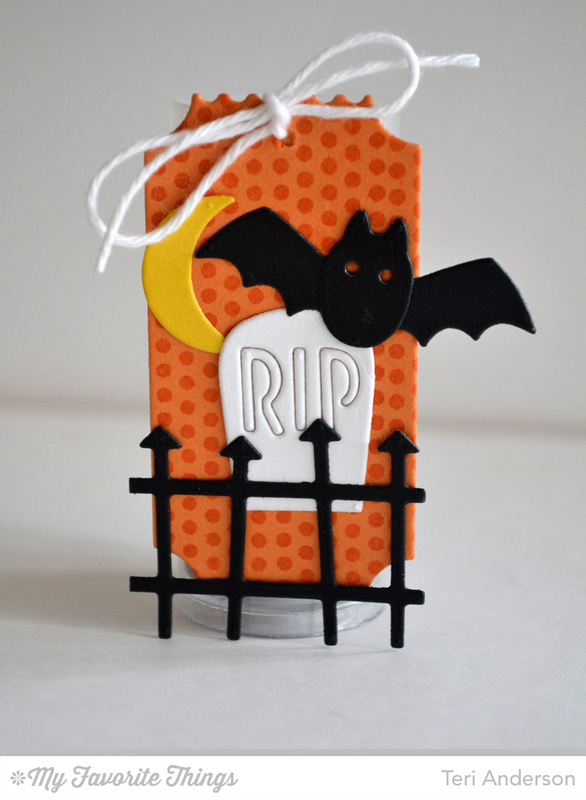 I stamped the pattern on top and then used the Spooky Scene Die-namics to … well… create the spooky scene. Are you ready for project number 2? It’s coming right at you right now. So I once again whipped out the Just a Ticket Die-namics to make a couple tags. I stamped the polka dot pattern on top and then stamped the words from the Spooky Sentiments stamp set onto one of them and the little monster guy from the Trick or Treat set onto the other. With that, here is treat container no. 3. 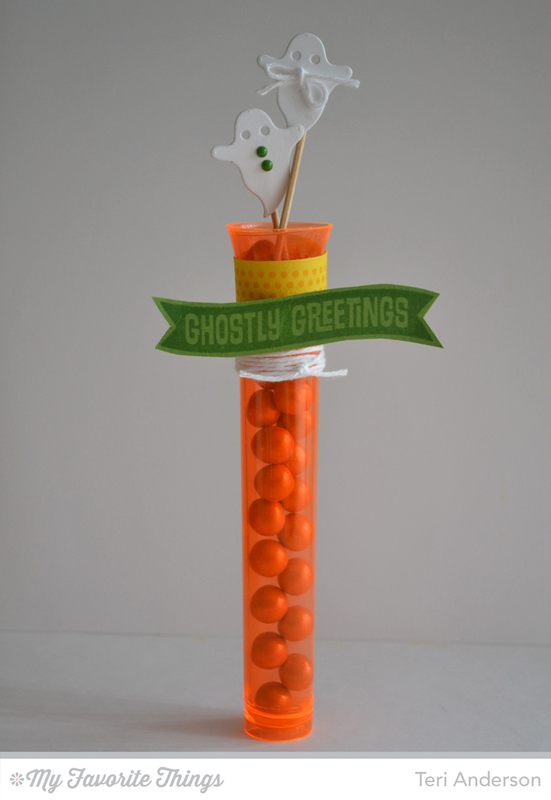 I found these tubes the other day at Dollar Tree and thought they would sure be fun to use for some Halloween treats. I filled this guy up with candy and then fashioned a circle to put inside it to use as a lid. 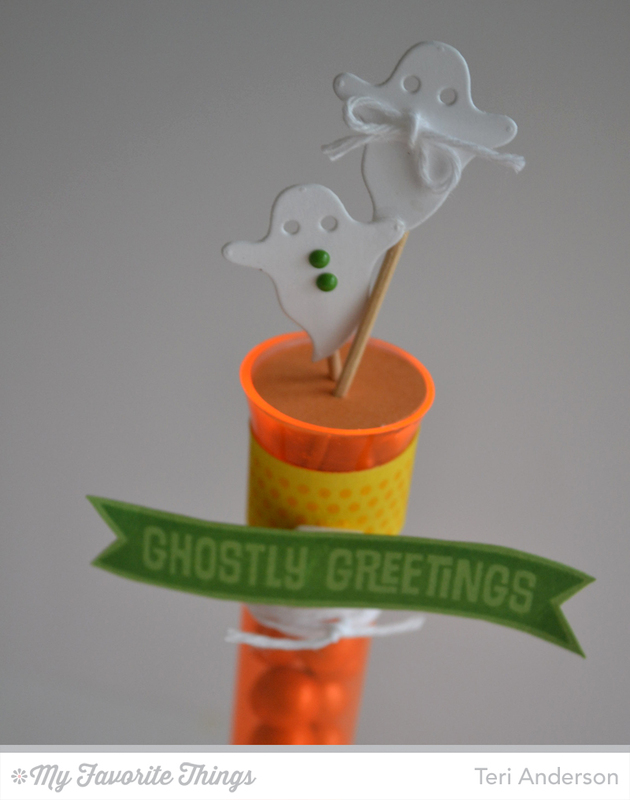 I created the ghosts by die-cutting them with the Spooky Scene Die-namics and then adhering them to toothpicks. To give ’em a little extra personality, I tossed on some enamel dots and bow. Lastly, I’ve got one more treat container to show you. It’s not really a treat. Instead it’s more a Halloween favor. One of my neighbors’ sons is not really a candy fan so I thought I always try to give him something trinket like. 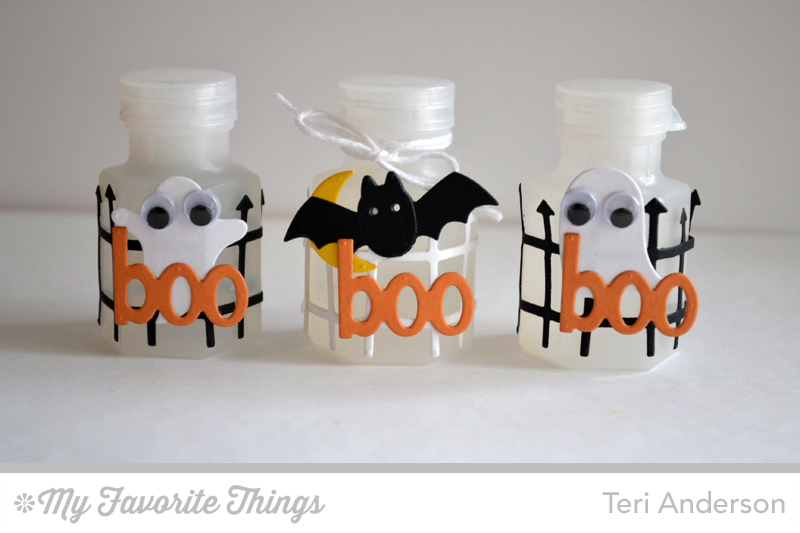 These are just little bottles of bubbles decorated up with the Spooky Scene Die-namics. Of course, I just had to live on the edge and throw on a couple wiggle eyes to make the ghosts a little goofier. By the way, you might be wondering where I found the bubbles. Well, I found them in the wedding supply aisle at Michaels. I’ve seen small packs of them at the Dollar Tree too. Thanks for swinging by today. Be sure to hit the MFT Blog to see which other design team members are taking part in this month’s Creative Challenge.